We provide high quality Sodium Bromide in the domestic as well as overseas market. Processed from the finest quality raw materials using latest technology, Sodium Bromide Powder offered by us is used in number of industrial applications. Denoted as NaBr, Sodium Bromide is a white, water soluble crystal with bitter and saline taste. It absorbs moisture from the air rapidly. Sodium Bromide Powder is generally uses as layer on photography films. It is also used as raw materials in manufacturing of medicine and as chemical intermediary to make bromides. 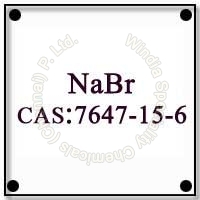 Additionally, we are one of the renowned Sodium Bromide Crystalline Manufacturers in India. These are packed in 25 kg HDPE woven sacks with inner lining and 25 kg HDPE drums.